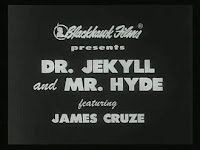 One of the earliest film versions adapted from Robert Louis Stevenson’s classic novella was this 1912 release by Blackhawk films and directed by some-time actor Lucius Henderson who later claimed that he discovered Rudolph Valentino, As the titular dual-personality doctor, Dr Jekyll and Mr Hyde stars veteran movie actor James Cruze who later went on to work at Paramount in comedy silent shorts with Wallace Reid and Roscoe Arbuckle. There are certainly some unfortunate comic undertones in this adaptation, not to mention changes to the plot to suit budgetary and time constraints to accommodate a one-reel (12-minute) format. 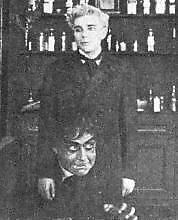 Immediately upon opening, we see the blonde-haired Jekyll (reminiscent of a young Chaplin) in his lab reaching for the flasks and, before glugging down his new potion, a few expressions of understandable trepidation. He has been consulting an industry text with the amusingly libel-baiting title 'Graham on Drugs'. 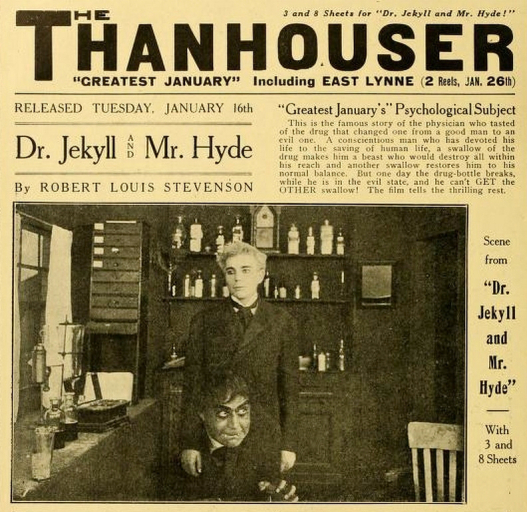 The first transformation is simply achieved by stopping the filming, then substituting Hyde in his place and continuing to film, a special effect trick used ever since its discovery by accident by George Melies almost twenty years before. Cruze’s Hyde is now a dark-haired snarling beastie with stark staring eyes, courtesy of what looks like mascara underlining them, fanged teeth and heavy brows. Hunched over, he rages at the world with clawing hands. Fans of the Who may recognise a certain raddled Keith Moon look about him, apt considering that the film manages to convey Jekyll’s seething addiction as a form of increasing alcohol dependency. 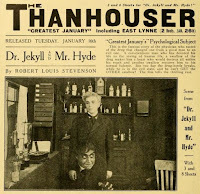 There is a fast dissolve back to Hyde’s well-groomed alter-ego, allowing us to see him courting the minister’s daughter, one of many alterations from the book that the film makes, which at least here enables a saintly contrast with Jekyll’s hideous hidden evil. 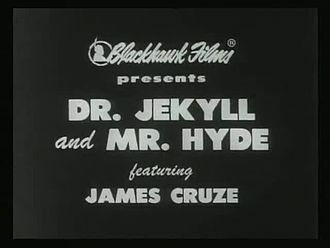 An intertitle suddenly jumps the time-line to some months later where by now the drug “causes him to change to his evil self against his will”. Hyde has become a notorious menace, intriguingly not in the usually authentic setting of the city of London, but “in the village” in which Jekyll lives. Bad luck for the doctor as that makes his wicked other side harder to conceal than in a crowded metropolis – you know how village folk talk. Jekyll finds Hyde’s desire to show himself also puts a damper on his love life, interrupting his woodland idyll with his fiancé when the urge to transform grips him. 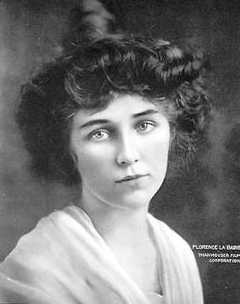 His sweetheart is played by Florence La Badie who was introduced to film by her friend Mary Pickford. Subsequently she became a star, notably later working with D.W. Griffith but is most famous for The Million Dollar Mystery, a serial she co-starred in with James Cruze in 1914. Sadly, there’s no mystery as to what happens next as Hyde attacks her and kills her father when he comes to the rescue. A moustached village policeman pursues him to his home, where he safely turns back to Jekyll. In the next scene after we learn that Jekyll wants to get away from the pain he is causing his fiancé, he coincidentally sees her on the street (not that unlikely in a village?). Just as he seems to confess his uncontrollable tendency to morph into a ’70s rock star drummer, he cannot un-Hyde any longer and has to leave her without explanation. Back home, his butler (Poole in the novel) hears a commotion and calls the police, fearing that this wild man has gained entry to his master’s study. The cop hacks down the door with an axe but it is too late. Hyde has poisoned himself to death. Disappointingly, the onlookers only see his monster face. The film robs us of the all-important chance for him to transform back to Jekyll before his fiancé. A rushed, sketchy yet interesting archive piece from the very earliest days of silent horror.